Due to technical internet issues Cocas has asked me to release this for him as he's unable - This is the V2.0 update of Cocas and Spinners fantastic "Sea Kestrel" pack and is a fairly comprehensive overhaul of the original pack with almost everything either new or improved! This pack includes all the Effects, Weapons and Sounds required to run on a standalone setup but it has only been tested on an Full 5 Merged setup. Unzip then copy and paste the Effects/Flight/Objects/Sounds folders into your Mod folder (usually C:\Users\YOUR NAME\Saved Games\ThirdWire\StrikeFighters2 **or whatever yours is called**). 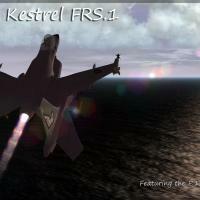 Sea Kestrel FRS.1 ('88 - '05) - Designed for the Royal Navy as a Fleet Defence Fighter with a secondary ground attack role. 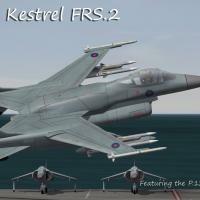 The Sea Kestrel's hovering ability allowed the Royal Navy to keep it's carriers smaller and therefore cheaper. All 3 Sqns were painted in Extra Dark Sea Grey with High Viz roundels. Sea Kestrel FRS.2 ('06 - '20) - This massive upgrade saw everything from the engine to weapons to the avionics all hugely upgraded, especially the weapons. It included a new Nose mounted FLIR camera and the ability to carry the more advanced weapons that the RAF had developed for the Navy. All 3 Sqns were repainted into Medium Sea Grey. Hovering is quite difficult at 1st. With a fuel weight of under 25% and no weapons you can hover at around 55% thrust but without a working Nozzle gauge it's difficult to tell where your nozzles are pointing, especially as the 3D model nozzles stop moving at only 40' visually! My recommendation is to apply fully forward nozzles (98.5') and then slowly move it backwards until the engine exhaust dirt looks like it's pointing at 90' but it's not ideal (see Alternate Cockpit below). The mapping is "interesting" in some places with stretching, especially on the 2 Booms. The 3F skin (winter Camo) was really tricky, so much so that I wanted to punch a thousand cute kittens by the end after spending hours/days trying to get the edges to match up! So sadly it's not as good as I'd like but the PS templates are out to so hopefully you can improve on my skin. Included in this pack is Bobrocks fantastic Harrier AV-8B cockpit which, as it includes important Nozzle info, makes hovering much easier. However the Cockpit is more limited in comparison to the Kestrel (F-23/29) version so, if you're not bothered about trying to hover that much, I'd stick to the original Cockpit. Installation is simply dropping the Cockpit folder with it's 2 ini's into your A/C and altering the aircraftname.ini to point to the 2 new ini's. I'd make a backup before you though just to be safe! Please use at your own risk, if you don't know how to alter ini files then please don't attempt to install the new cockpit in case you break something! Massive thanks to Cocas for creating the 3D model and patiently modifying it everytime I asked for any/every crazy little thing! Spinner for his fantastic work with the original Pack. Dels for creating his superb F-23/F-29 cockpit used here with his kind permission. Bobrock for creating his amazing AV-8B cockpit used here with kind permission. Ravenclaw007 for the stunning weapons he makes and I continue to enjoy using. Spillone104 for his Improved Afterburner Effects.